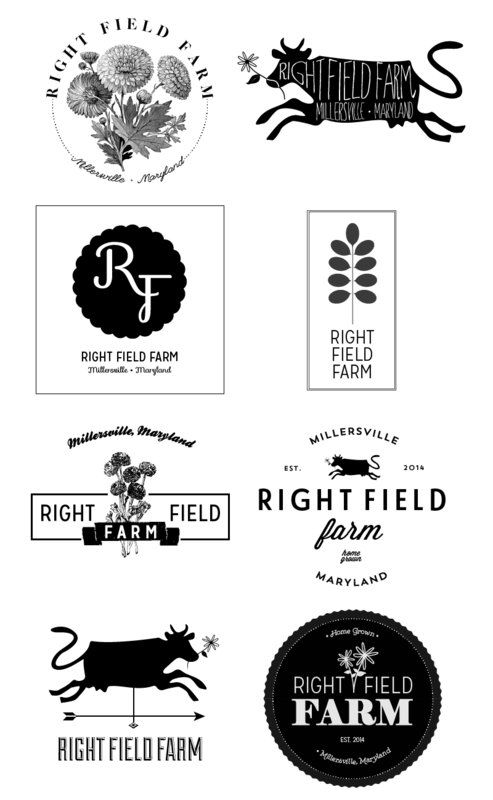 When I was approached about creating a logo for Right Field Farm, I was completely charmed. A young flower farm run by a beautiful family? Is that a dreamy graphic design project or what? I started by sharing some emails and questionnaires with the client so that I could get a feel for their background and goals. As a budding business, Right Field Farm is in the process of updating their website and developing their brand. I knew they wanted a simple logo that could be easily printed and replicated from home, so we decided to stick to black-and-white graphics. In the initial concepts stage, I like to provide a variety of ideas that the client can pick apart to help refine the direction of the overall piece. When we determine which graphics, letters, shapes, sizes, images, colors, etc. stand out, we can move forward with a tighter selection. Right Field Farm wanted an updated and polished look that also highlighted the fact that they are a small, family farm in a small town near Annapolis, Maryland. The logo design should reflect the local and homegrown feel while still being sophisticated and have some room to grow with the business. Here is the final logo. We love the cow; she's whimsical and spunky and farmy-but-not-too-farmy. This was truly a fun project to work on, and it was a delight going through the design process with such an awesome client. I can't wait to see what grows on Right Field Farm! That's so exciting! What a great logo.